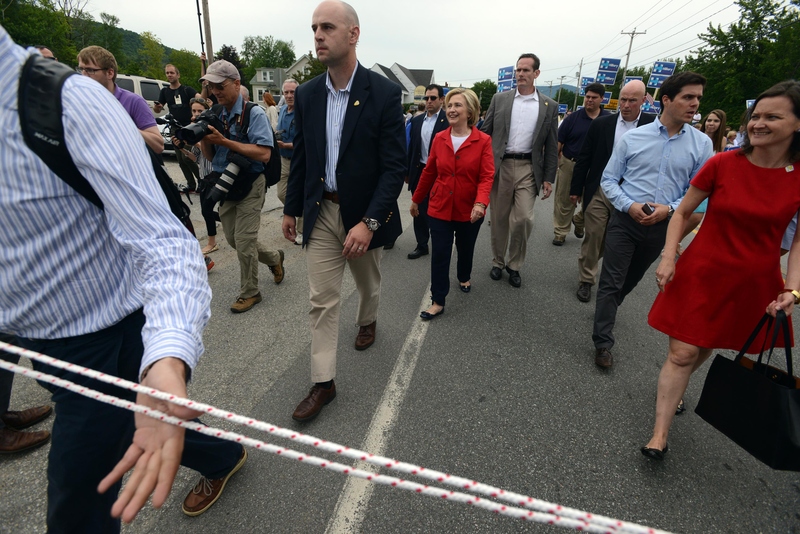 GORHAM, N.H. -- Nothing says freedom on Independence Day like corralling reporters with a rope to keep them away from Hillary Clinton as she marches in a July 4th parade. Clinton's advance team used a rope to separate the press from the Democratic presidential candidate as she walked the parade route, at times dragging the cranky reporters down the road. The decision to lasso the media was a reminder of Clinton's fraught relationship with the press. Pictures of the reporter-roping took on a life of their own on social media and overshadowed what was supposed to be a news-less holiday photo-op in the early primary state. "Keep walking, keep walking," Aide Huma Abedin said loudly to no one in particular in the thick of the parade as a protester carrying a "Not voting for Monica Lewinsky's ex boyfriend's wife!" sign screamed, "Carpetbagger" at the candidate. Without batting an eye, Clinton continued briskly walking, stopping quickly to shake hands with parade-goers along the sidelines. Clinton's longest stop occurred mid-route when she came across mother and son, Nellie and Jose Pequeno. A tear streamed down the face of the veteran, paralyzed and in a wheelchair as a result of getting hit by a grenade in 2006, as Clinton told him, "This is all for you," of her run for president. "It was nice that she stopped to recognize Jose," Nellie Pequeno said of the emotional moment, before adding that it was "not all that special." "There have been a lot of candidates who come through," she said. "I've been through a lot." Upon reaching the end of the short parade route 45 minutes later, Clinton proclaimed that the parade was "fabulous." Clinton then made a stop at Dairy Bar, a restaurant in the neighboring town of Berlin, where a reporter asked her a comment on Donald Trump's controversial comments regarding illegal immigrants. Clinton declined to engage, saying, "You know, I'm going to sit down and have some pie." The New Hampshire Republican party wasted no time in seizing upon the spectacle, releasing a statement slamming the former Secretary of State for her campaign style. "The use of a rope line at a New Hampshire parade is a sad joke and insults the traditions of our First-in-the-Nation primary," the GOP statement said. "Today, Republican presidential candidates marched in parades across New Hampshire that were open to the public without obstruction from their staff."